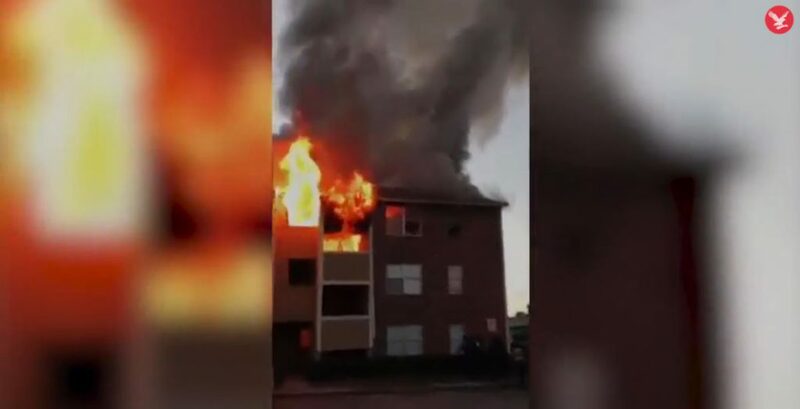 With flames rising Shuntara Thomas had no choice but to let go of one-year-old, before jumping from the third floor herself. A have-a-go-hero has been hailed after he caught a baby dropped from the third-floor window of a burning apartment building. Byron Campbell held the one-year-old tight after her trapped mother was left with no option but to trust the stranger to catch her. Footage of the dramatic rescue, in the Texan city of Dallas, went viral after it was placed online. Six other residents only survived the massive inferno – which destroyed 24 apartments – by jumping onto mattresses placed below. And she added: “Throwing my baby out to a complete stranger... Without him my child’s life would not have been saved." Ms Thomas was, herself, then forced to jump during the drama at the city’s Meadows at Ferguson residential complex. Mr Campbell appeared somewhat nonplussed by his own heroism. It also emerged that he had alerted many other residents to the blaze in the early hours of Wednesday morning. After noticing smoke coming from windows of the block while driving in the neighbourhood, he pulled over and joined police and firefighters banging on doors to alert residents to the danger. With exits from the top floor apparently already blocked, mattresses were laid for six people to jump onto. "Everybody held the mattresses on both sides and we told everybody just aim for the mattresses," said Darren Hicks, a man visiting friends who helped with the rescue. Just three people – including a Dallas Fire-Rescue firefighter – suffered minor injuries. The block of 24 apartments was immediately pulled down after the fire was put out due to concerns about structural safety. Some 40 people, including Ms Thomas and her baby, have been left temporarily homeless, the US Red Cross confirmed. Investigators have since said they were not able to enter the block to determine what sparked the blaze.